Our programs offer a combination of community integration, base site programming and employment opportunities. Dungarvin California works cooperatively with each individual, his or her family, support team and county/state entities to ensure quality services. Dungarvin established services in California in 1997 with the opening of two day programs in Sonoma and Solano Counties in the cities of Santa Rosa and Vacaville. Our third program in the city of Hayward began services in June 2003. In 2009, we began providing Behavioral Services and opened a fourth day program, located in Rohnert Park. In 2014, our first program in Southern California opened for services in Long Beach, and in 2015 we opened the Norwalk program. Our programs offer a combination of community integration, base site programming and employment opportunities. Our staff is skilled at meeting the needs of individuals with autism, traumatic brain injury, challenging behaviors, and medical frailties as well as working with individuals who have a wide range of physical disabilities including visual, speech, hearing and mobility impairments. We work closely with the individuals we support to ensure that we develop a meaningful programming experience which fully recognizes each person’s strengths, preferences and interests, which is maintained over the course of one’s attendance in our program. Our services in California have been highly rated by Regional Centers and Licensing evaluators for our individualized approach to developing services which are of interest to the individual and allow for him or her to participate in activities and programs which are beneficial to their long term growth. Following is a list of many of the areas that we have or are able to focus on as we develop a service plan. This list is always growing and changing as we develop new programming ideas to further enhance our offerings. COMMUNITY INTEGRATION includes supports and assistance in citizenship; recognition of rights and responsibilities; use of community and neighborhood resources; safety skills; public transportation; membership in clubs and social volunteer organizations; emergency contracts; telephone use; socializing and recreation. COMMUNICATION SKILLS includes the development of listening skills; increasing expressive language skills; securing and development of alternate systems of communication, as needed; developing verbal communication skills; developing effective means of seeking assistance; and developing techniques to increase assertiveness and self-sufficiency. DECISION MAKING/PROBLEM SOLVING SKILLS includes providing regular information and reminders to facilitate the person’s awareness and understanding of the numerous options available in his or her daily life; developing the ability to make decisions; developing the ability to recognize and/or determine choices; recognizing and identifying problems affecting the individual; problem resolution skill development; developing coping skills to deal with problems or consequences of decisions made; and encouraging involvement and active participation in the individual’s living situation and program. SOCIALIZATION SKILLS includes making friends and establishing acquaintances; development of appropriate eating skills and manners; increasing age appropriate interaction with peers; appropriate expression of negative emotions; encouraging assertiveness; increasing age-appropriate and acceptable behavior; developing recognition of the needs, rights and responsibilities of self and others; developing recognition of rights and responsibilities of his or her sexuality and appropriate ways of expression; as well as advancement of skills in identifying and effectively dealing with emotions. LEISURE/RECREATION SKILLS includes development of skills in leisure activities; group interaction skills; increasing the use of community resources available; developing skills to aid in relaxation; developing skills in identifying, planning and following through with leisure activities; identifying appropriate and recreational resources available; and developing age appropriate behavior related to activities at home and in public. MOBILITY assistance includes assuring physical adaptations coincide with any alterations in mobility; training in use of adaptive equipment and aids; providing a barrier-free living environment; locating, assisting, and training in use of community resources; coordinating physical/occupational therapy evaluation and implementing recommendations of therapist(s), as needed; assuring all staff are trained in proper transfer techniques and other physical assistance/cares; and coordinating with appropriate health care providers to assure identification and treatment of any complications. SELF-CARE SKILLS includes the development of grooming routines and personal hygiene/health care skills; learning about basic nutrition and encouraging positive eating habits; developing dressing skills; improving toilet skills; and the development of laundry skills. DAILY LIVING/DOMESTIC SKILLS includes improving skills in establishing routines for upkeep of their environment; developing the respect for personal property (their own and others); developing functional cleaning and cooking skills; developing environmental safety skills; and developing the person’s self concept of a cooperating contributing member of the day program and community. MEDICAL/HEALTH CARE includes recognizing and identifying symptoms of various illnesses or previously existing medical problems; training in the use of any adaptive equipment; scheduling and attending necessary medical appointments scheduled with outside services; and identifying the need to secure professional nursing of other health care services, as needed. MONEY MANAGEMENT includes the development of a system of money management that is conducive to the individual’s situation, skills, and needs; assistance in understanding the importance of bill paying and budgeting; maintaining a record keeping system, if appropriate; use of banking services to maintaining savings and/or checking account; and developing responsible spending and purchasing habits. VOCATIONAL STABILITY provides assistance in recognizing vocational strengths and weaknesses; identifying work options and pursuing the employment search; developing positive working team relationships; identifying job-related problems and developing independence in solving such problems; recognizing job duties. If you are interested in services from Dungarvin, or need more information about current openings or future placements, contact us! For information regarding the consumer and applicant appeals procedure, please call the California Department of Developmental Services (DDS) at (916) 654-1958 or click to visit the DDS website. Three wheelchair-accessible vans with wheel chair lifts to provide transportation to and from our facility and enabling access to the community on a regular basis. Four wheelchair-accessible vans with wheel chair lifts to provide transportation to and from our facility and enabling access to the community on a regular basis. 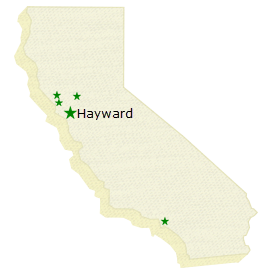 The Northern California Central Office is based in the Hayward Day Program. The Southern California Central Office is in the city of Torrance, California.